Boy I tell you what, the temps here in Hoosierville have plummeted to abominable lows. And unfortunately they’ve stayed there. A few weeks ago it snowed and snowed and then almost ever since it’s remained below freezing, so the snow just stays and stays. 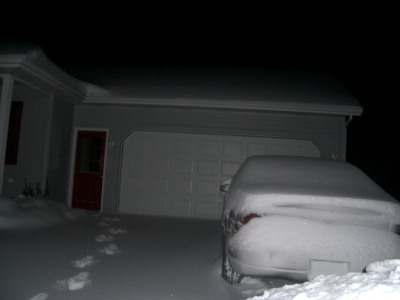 That was from a week or two ago right after I shoveled the driveway. What a royal pain. But, this Sunday we head off to Utopia, so all is well!! In the meantime, here’s what I use to ward off the icy fingers of Hoosierville. 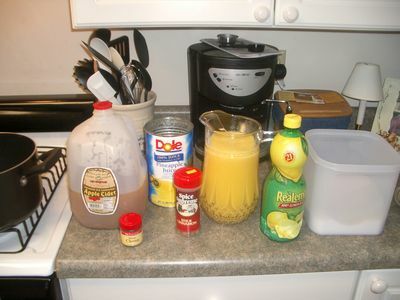 It’s called ITF’s Hot Wassail Punch, and I got the recipe from my Mom. 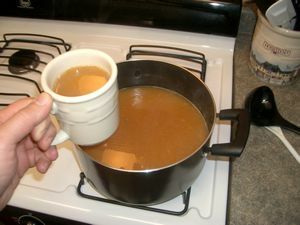 Combine ingredients in large kettle. 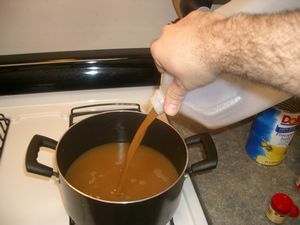 Stir, bring to a boil. 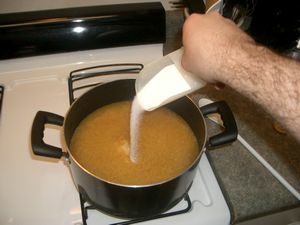 Now be careful and don’t let it boil over. 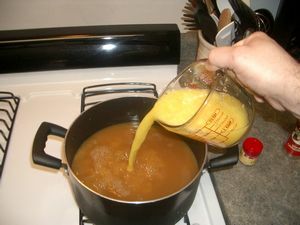 I have a bad habit of forgetting about stuff on the stove, one time I boiled this over and it made a big old mess on the stovetop. I hope I learned my lesson! 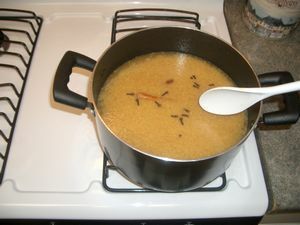 Bring to a boil, then simmer for 10-15 minutes. 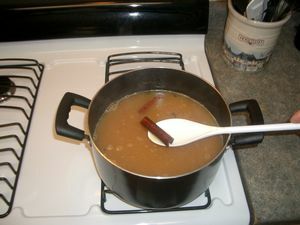 Remove the cinnamon sticks. Dip into your favorite mug and let it cool a minute, it’s smoking hot. Then you can drink it. As you get toward the bottom of the kettle, it seems to get stronger and stronger. You may dilute it with a little water if so desired. There it is, one of ITF’s secrets to survival in this frozen land! This recipe makes enough for about 1 person for the evening, but if you’re in a generous mood you might want to consider sharing with others. Awhile ago I said I’d tell you what I gave my wife for her birthday present. 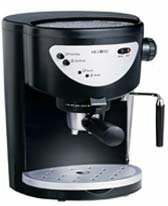 It’s a somekinda fancy coffeemaker, a Mr. Coffee ECMP40. Pretty uninteresting to me, but my wife was sure pleased! So my piano-playing buddy Darin recently was lamenting the fact that there aren’t more men who play piano. In fact, he says, in all his blog travels he has never found another male pianist! Darin, I’m happy to tell you that your search is over! He further questions, “Is a guy pianist a wimp?” Of course not, I say. Maybe a little misguided, but that can be remedied with the revelation of vocal light! It is no secret that I’m an a cappella freak. I love a cappella music of all kinds. In general, I find instrumentation of nearly every sort quite boring. There are exceptions of course, and the occasional instrument does have it’s very limited place. For instance, I believe every child should have to take piano lessons. The piano can be a wonderful tool for learning music theory (so that theory can then be applied to the voice of course). It might surprise you to know that I took piano lessons for several years as a small child. I was too lazy and short-sighted to last though, which I now regret. Further keyboard skills today would greatly enhance my current vocal producing and administration work. But alas, it isn’t so. I do, however, retain even now quite a bit of the keyboardist talent I once nurtured and cultivated! And for your edification, tonight I blew the dust off the old ivories, sat down and hammered out an instrumental masterpiece! Allow me to apologize in advance for the quality of my instrument, however. The only thing I have to work with is a rather old electronic keyboard, so my normally larger-than-life dynamics are cut off at the knee. The louds, the softs, the arpeggios, the delicate and intricate passages, the exquisite pedal work, unfortunately all will have to be saved for another time. But rest assured the raw talent still shines through! Maybe God didn’t want me to continue on the keyboard path because He knew I couldn’t handle the fame, stardom, and riches that I would have had with a concert pianist career. Now that’s something you don’t see everyday, at least I don’t. Today was the first time I’ve ever seen it. It was a small electric chainsaw and the insulation was still in a roll. He was cutting it into strips. I’m sure it beat using a utility knife. Brother John and his wife are currently in Hoosierville, and guess what we’re doing tonight! And you really must go read Food Passer’s Iguana Story! I set out here with a certain amount of trepidation or apprehension. Publicly criticizing one’s own church is a rather bold move and one that shouldn’t be taken lightly. It’s easy to criticize and it’s easy to whine but quite often it’s inappropriate. So if you’re going to stick your neck out to such a degree you’d better be right and it better be important. I am and it is. Our ushers ignore anyone seated up front behind the pulpit. Whether passing out papers or taking up the offering, if you’re up front on the platform you might as well forget it. No papers for you, and just keep your money. I grew up being trained by example that as an usher you always courteously extend the plate to the service participants seated on the platform before you begin harvesting from the congregation. That’s just good, right, polite, and proper. The gents on stage are people too, and they also have contributions for the church coffers! And the time before I did give it to her but she isn’t completely used to being married yet evidently. She put it in my Bible which I then carried up front! Oops! The money counters had a good laugh at us after church. This is a real concern. Preachers, song leaders, and Sunday school superintendents could theoretically just get tired of being ignored by the ushers and decide that you know what, I guess they don’t want my tithe! They never want to take it from me so maybe I’ll just leave it at home! And what would happen to the church if the leadership were forced to such an attitude?! Leadership by example; soon the offerings would plummet, financial ruin would ensue, dissolution would be imminant! All because of improperly trained ushers! Maybe we should institute an Usher Training Progam and ramrod all our ushers and potential ushers through it. Come next business meeting I think I’ll propose establishing a committee to study the feasibility of authorizing the development of a council to look into commissioning a board to fashion a suitable training program. Once our conference would see the incredible success of this solution to our widespread problem, I’m sure we could get the UTP’s in our sister churches and our Bible schools and put an end to this epidemic. But as for now if you ever visit my church and want to avoid the collection plate, come on up and sit behind the pulpit! So just yesterday I told you all about how much snow we abundantly received and all that awfulness. This morning when I got up it had done it all over again. Our neighborhood wasn’t plowed yet, I wasn’t sure I was even going to be able to make it out on to the road and then to work. Which wouldn’t have been all bad. We got, I don’t know, 3-5 inches at least just overnight. What a mess. This is the only pic I got, it’s not the greatest. I took it out my car window just when I was leaving in the morning. 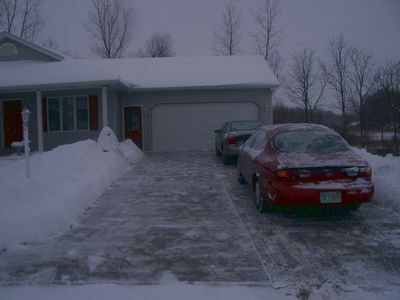 The cement was shoveled the night before. Last Sunday we skipped out of Sunday School just a little early and headed for the airport. When we arrived we found out that our plane was slightly delayed, so we broke out the laptops. Cool! PDX has free wireless internet! That made the time go fast. We finally got on our plane around 3 or so and flew to Denver. Since we were a little late, we didn’t have much time to make our connection, but it wasn’t far away and we were fine. Man, crowded planes, no leg room, I was ready to be done. We finally got in to Indianapolis (remember, Indiana-POLE-iss) between 11:30 and 12 Sunday night. It was cold. We caught a shuttle to the long-term parking lot where our car was and found a nasty surprise. There was a solid sheet of ice over the whole car. It looked like it poured down rain then immediately froze, I’ve never seen anything like it. We couldn’t chip or scrape it or anything, we had to wait for the defrost to get warm enough to soften it up. Couldn’t believe it. There was snow on the ground, but the roads were clear and dry. Jewel drove the last hour (while I slept), I was wasted. We arrived home a little before 4 a.m. Went to bed and I slept another hour or so, then got up and went to work. Glad I don’t have to relive that day at work. There was about 3 inches of snow on the ground. It stayed very cold the next few days, very cold. Then today when I got off work it had just started to snow again. A few hours later there was another 3 or 4 inches of snow on the ground. Only a little more than two weeks until I get to go to Oregon again!!! My nephew Tyler was buried on Wednesday. Here’s the newspaper article. The obituary is online also, as well as a memorial guestbook. Update: The Sunday Oregonian article is online, as well as couple of pictures. 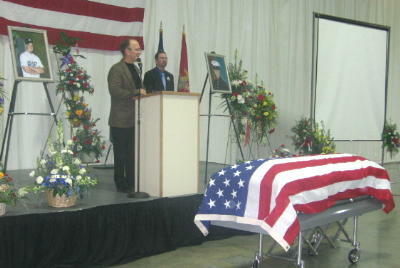 The funeral was held at the Linn County Fair and Expo Center, around 700 people attended. 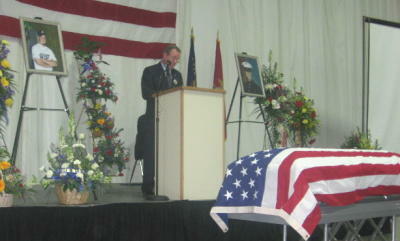 My brother Galen opened the service. Oregon Governor Kulongoski spoke. He also presented Tyler’s mom with the Purple Heart awarded to Tyler. 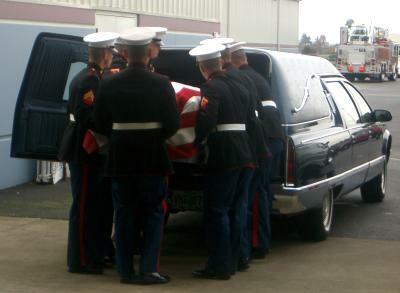 A Marine Honor Guard served as pallbearers. 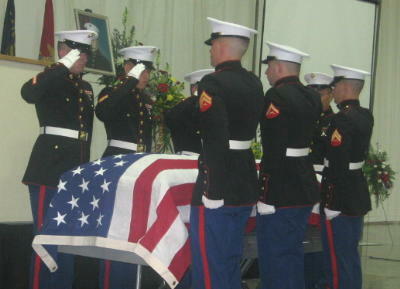 The Marines gave a 21-gun salute at the graveside. The banner hanging over the front door of Tyler’s house. Didn’t quite make that lofty goal of bedtime by 6 p.m. Made it by about 9 instead. Up at midnight, left by shortly after one for the long drive to Indianapolis (pronounced Indiana-POLE-iss). Actually the drive went really well, clear dry roads and no traffic. I think we made it in just under 3 hours. Now we’re experiencing the joys of sitting around in the airport. What a drag. And my laptop battrey is shot so I can’t use it unless I’m sitting next to an electrical outlet, and that can be a difficult proposition on these kinds of trips. I think when we get to Chicago maybe I’ll buy the new Grisham novel that just came out in paperback. And so I did. I bought The Broker in paperback, and I got a good start on it during the flight. Great book so far. Fairly uneventful flight, really long and cramped though. Finally arrived in Portland where Mom and Dad and Jean and Cody met us. We waited an hour or so for my brother Mark to fly in, then we went to lunch at Sweet Tomatoes. What a great restaurant! It’s a soup and salad buffet, I had never heard of it before. Then we went home and started in with the family get-togethers. I went to bed early, that was just too long of a day.